When Falcon Airways and Air Safaris went out of business in 1961, a tour company which had booked tours with both companies, decided it was time to start their own airline. Captain Ted Langton of Universal Sky Tours decided this was the best way to ensure control of quality and costs of the flights. On 01Dec1961 Euravia (London) was founded, which started operations in May 1962 with a Lockheed L.049 Constellation (Ex Israelian El Al) and principal shareholder was Universal Sky Tours. Euravia's first revenue flight was made on 05May62 with Lockheed constellation G-ARVP: an inclusive tour flight from Manchester to Palma de Mallorca. Boeing 757-204(ER) G-BYAD (c/n 26963/450) is seen here taxying at London-LGW on 07Aug04. On 06Dec64 the Bristol Britannia 102 was introduced and the company changed its name to Britannia Airways. These Britannia's seated 112 passengers and incorporated galleys, which enabled Britannia Airways to become the first British holiday charter airline to provide hot meals (usually cottage pie!) in flight. 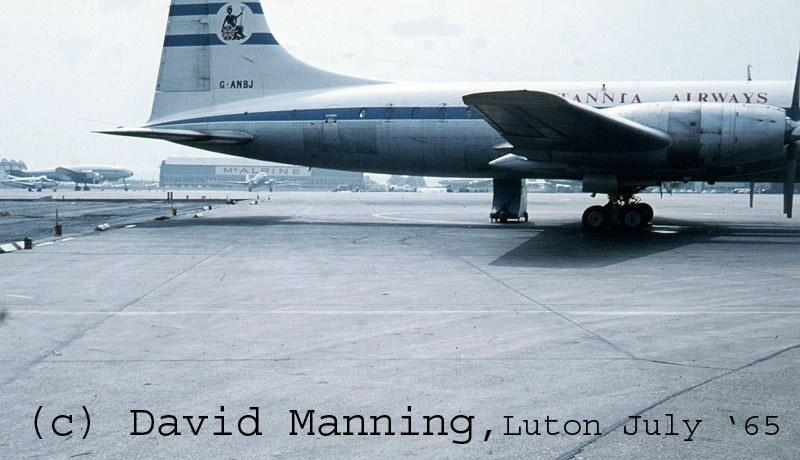 David Manning sent me a photo, taken at Luton in July 1965 that shows the Britannia's in use while the Constellations of Euravia lingered, waiting for the scrapman. The Thomson Organisation took over Universal Sky Tours and Britannia Aws in April 1965 and Boeing 707 were used for charters to Hong Kong, Kuala Lumpur and other long-haul destinations. It converted to short-haul operations in 1973 with the fleet conversion to the Boeing 737. This remained unchanged until 1985. In 1984 Boeing 757s and 767s started to be introduced in Britannia's fleet and long-haul destinations were again included. Thomson took over Horizon Travel and the purchase included Orion Airways, the 6 737s were integrated in Britannia's fleet. The 737s were gradually replaced by 757s. 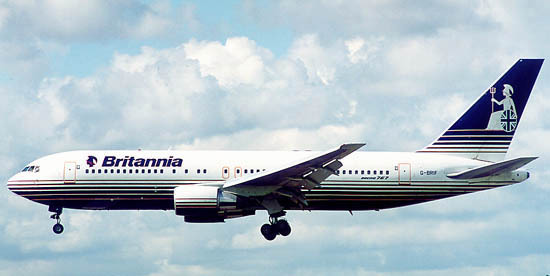 During 1997 Britannia establised a German subsidiary: Britannia Deutschland (4 767s on long-haul flights). In Sweden the tour operator Fritidresor (and its airline Blue Scandinavia) fell victim to Britannia's expansion in 1998. In 1999 the Airbus A320 was introduced (to be able to operate to smaller airports) and in 2000 the Boeing 737 was reintroduced (737-800s). In 2000 Thomson accepted a takeover bid by the German concern Preussag. Showing the stylish Britannia livery is Boeing 767-204(ER) G-BRIF (c/n 24736/296), seen on finals into Manchester-MAN on 19Aug2000. 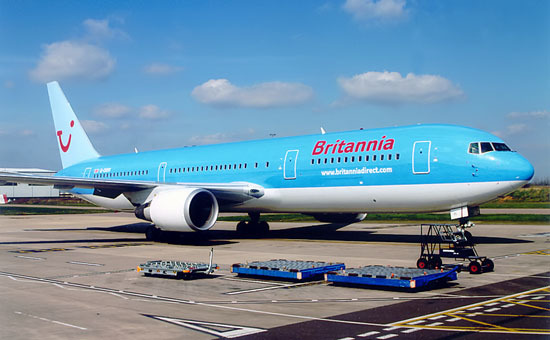 During May 2004 the news was published that Britannia would be rebranded as ThomsonFly, adding to a new direction for the company which had also established a separate low-cost no-frills carrier: Thomson Fly. Britannia Airways was the charter airline for Thomson/TUI UK and regarded as the No.1 in the travel business in the United Kingdom. But TUI stated it wanted to maximise the Thomson brand, which had been in the holiday market since 1965. Anno 2004, Britain was one of TUI's most important markets, accounting for 80% of turnover within its Northern European division. On 09Apr04 I came across the Boeing 767-304(ER) G-OBYI (c/n 29138/783) at London-LTN, having changed into the "World of TUI"-livery. Thomson Travel was acquired by Germany's Preussag in May 2000 for UKL 1.8bn and embarked on a three-year project to rebrand its operations under the name "World of TUI". The takeover meant Preussag would remain Europe's largest travel company, but to get the deal past the European Commission, Preussag was required to sell their stake in Thomas Cook Holdings, Britain's third-largest tour operator. Thomson Travel Group included Thomson Holidays, Lunn Poly, Britannia Airways, Jetsave, Crystal Holidays, Magic Travel Group and Simply Travel within its portfolio. During 2001 Hapag-Lloyd was the first to receive the new blue colourscheme, as it was developed by its owner Preussag, to establish one European identity. Aircraft from Britannia, Corsair, NEOS (Italy) & White Eagle (Poland) were also meant to follow. And now a famous name in England's commercial aviation history falls victim to these changes. Newsflash in October 2005: Thomsonfly will officially also be used as the new brand for all charter services operated by Britannia Airways as of October 31. I have Michael Blank to thank for spotting the initial error... thanks Michael!